Work on your dressage skills in Portugal! This dressage riding school has been in operation for over 30 years and is steeped in the classical horsemanship tradition. Beginning and experienced riders have the opportunity to experience the renowned Portuguese pure-bred Lusitano horse and classical equitation in the spirit of the grand masters. Top riders and horses from all over the world train at The Riding School of Alcainça. Located on a family-owned country estate, this world-renowned riding school for top-level dressage tuition gets you in the saddle on majestic pure-bred Lusitano horses. Three top instructors teach students dressage, including Georges Malleroni, who was a student in classical dressage of the “Haute Ecole” under Nuno Oliveira, the great Portuguese Master and one of the best world Masters (deceased). Horses have been trained to a medium dressage standard and are able to do Shoulder In, Half Pass, Flying Changes, Piaffe and Passage. Train up to twice a day with expert and multilingual dressage instructors in the indoor or outdoor arenas on the estate. Portugal has a very long tradition in horse breeding and equitation and the Lusitano horse is a living treasure of Portuguese culture. Located just 40 minutes outside of Lisbon in the village of Alcainça near the national park of Mafra, this riding vacation destination has a great location for exploring nearby Lisbon before or after your trip. Portugal is a true gem for travelers. The Atlantic Ocean on the west coast helps assure a nice, even temperature throughout the year so that even in July and August it never gets too hot. Add to this the incredible beauty of Lisbon, Sintra, Estoril and other areas you have an ideal vacation land. This trip is good for riders and their non-riding companions, as you can book the amount of time you would like in the saddle, so if you'd like to ride in the morning while your non-riding companion relaxes by the pool and then sightsee together in the afternoon, this is more than possible. Where you stay in the village of Alcainça lies about 15 miles (25 kms) Northwest of Lisbon, 3 miles (5 kms) from the famous National Park Mafra and 9 miles (15 kms) from the Atlantic Coast. For optimal sightseeing at your leisure, renting a car is recommended. Alternatively a driver is available for an extra charge to take you to places of interest such as Lisbon, Mafra or the Portuguese School of Equestrian Art in Queluz. Pack what you'd normally wear in your lessons at home or when riding at home. We recommend paddocks and half chaps, as they are easier to pack, but bring your high boots if you'd like. A riding helmet is required. This part of Portugal is warm and dry for most of the year. In July and August, temperatues can rise into the 80's, but being close to the Atlantic means it's normally okay for riding. Bring layers and rain gear if you travel from October to March, the wettest and coolest months..
RIde Portuguese pure-bred and part-bred Lusitano horses, mostly stallions. This riding school's horses have a medium dressage standard and are able to do Shoulder In; Half Pass; Flying Changes; Piaffe and Passage. Lusitanos, which come from the same origin as the Andalusians, can be considered as some of the finest horses in Europe. In addition to dressage and trail riding, special experiences can be requested, including to the Portugal Lusitano breeding farms, the Golegã Horse Fair and the National Portuguese Riding School. Set on a hill-side, Escola de Equitaçao de Alcainça was originally built as traditional “Quinta”, a Portuguese country estate, complete with stables, indoor and outdoor schools, as well as an antique bullfighting arena which is nowadays used for traditional working equitation sessions or as a turnout for the horses. Guests stay steps away from the riding school and stables in a simple and clean guesthouse with four double rooms with private bathrooms and air conditioning or in accommodations located beside the center also with three double rooms with two individual baths. On site, travelers can gather in the living room, a large gathering room, an unheated swimming pool, an indoor riding arena and an outdoor (65 x 25 [m]) riding arena (half covered), a bullfight ring and a little chapel. A pool, overlooking the bullfight arena and the outdoor school, provides a pleasant and refreshing diversion after riding. All of the school horses are regularly turned out in paddocks and enjoy the sun just as our guests do at the pool! Meals are served in a dining room overlooking the indoor arena and complete with satellite TV. There is a bar and water, juice, tea, and table wine are included in your riding holiday. Homemade Portuguese meals are served daily in the dining room overlooking the indoor riding school. Chef Lena chef cooks all meals with healthy, fresh and mostly organic ingredients, and takes great pleasure in discussing her various recipes and traditional Portuguese cooking. Chef Lena also cooks delicious vegetarian meals. Please let us know if you have any special dietary requirements or allergies. Our Riders Lounge offers a quiet place to relax - next to an open fire in the winter - after a busy day of riding. Enjoy a glass of wine, a game of pool, or simply a good book and listen to the sounds of horses and rural countryside. A continental breakfast may include local bread, jams, cheese, cereal, seasonal fruit, orange juice, tea and coffee. A 2-course lunch with a meat/fish dish may also include salad, fruit, house wines, water, coffee or tea. A 3-course dinner may include soup, a meat/fish dish, dessert, house wines, water, coffee or tea. Riders who want to better their dressage skills in a lovely setting in Europe. Riders should be confident in all three gaits (walk, trot and canter) and understand the basics of dressage. $1890 USD* per person double occupancy for either 1 Week: 8 days, 7 nights with 7 days of riding lessons (2 riding lessons per day for a total of three hours) OR the Working Equitation theme week, outlined below. Low Season Discounts: Special discount of 10% for riders during the months of November and December. Special discount of 20% for riders during the months of January and February. * Prices shown are subject to exchange rate fluctuations. Includes full board. Included: Full board, which includes lodging, meals and table wine, water, juice and tea. Accommodation in a double room. Transfer to the visit to a Stud Farm. Riding instruction on school horses according to the special program (max. 2 riders per session) · Practical instruction in breeding, tack and other elements. Transfers: from Lisbon airport cost approximately $49 per vehicle each way and $52 from Lisbon city. The "Meeting Point" at the Lisbon Airport is near the Tourism Information desk, on the arrivals area. · Portuguese Equitation and Working Equitation classes are taught by instructor João Batalha who has been competing in these disciplines with some of the school horses you'll ride. · A maximum of 2 riders per group ensures instruction on an individual level which will allow you to benefit most from your lessons at Escola de Equitaçao de Alcainça. The lessons are taught in English. · A good basic riding level is required to participate. Riders shall be confident in all three gaits (walk, trot and canter) and understand the basics of dressage. 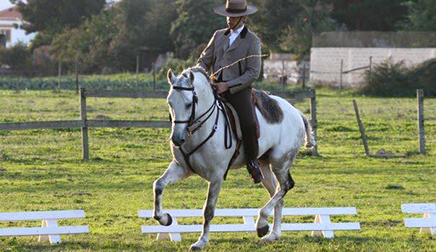 · Traditional Portuguese tack will be used for all riding instruction on our school horses. Prior to your first lesson you will have the chance to talk with your instructor about what you are currently doing and what you hope to achieve from the holiday and your courses. An interest in dressage is important on this holiday; you will need to be willing to learn from the experienced instructors to get the most out of your holiday. Riders should be balanced and independent at walk, trot and canter, and it is an advantage to know the basic lateral movements such as shoulder-in and half-pass. Instructors are multilingual and teach in English, French, Portuguese, Italian, Spanish, as well as a smattering of basic riding Japanese! Riders benefit from both experienced schoolmasters and professional trainers. If you are staying a week, you may want to take one day out of the saddle to enjoy sightseeing. If you are travelling with a non-rider, then you may wish to pre-book just one lesson a day which leaves more time to relax by the pool, watch horses and riders in training or to go on sightseeing trips. A trip to Lisbon or the beach from Escola de Equitaçao de Alcainça only takes 30 minutes. Portugal has a very long tradition in horse breeding and equitation. The Lusitano horse is a living treasure. Portuguese Equitation and Working Equitation are two disciplines that have been practiced in Portugal for centuries, proving the functionality and rideability of Lusitano horses as working horses. During this special week with the Working Equitation theme, guests will learn more about these two disciplines and practice on our school horses. Get an introdution to tacking up horses the traditional way in Portugal, compete with Portuguese tack. Enjoy a lesson in Portuguese Equitation and dressage in the morning and afternoon. During your week, the goal will be learn the art of riding in harmony with your horse. Visit to a Stud Farm (“Coudelaria”) dedicated to breeding Lusitano Horses. Riding lesson in Portuguese Equitation and dressage in the morning. Afternoon hack amid the local countryside for approx. 60 min OR Working Equitation (Maneability) session in the afternoon (approx. 60 min). * The above is a sample itinerary. It is subject to changes based on the weather and the trip guide’s discretion. My visit to Alcainca was a true learning experience. The dressage training gave me the opportunity to continue my development and I particularly enjoyed the quality and excellent training of the horses that I rode. I had the opportunity to ride several different horses, but enjoyed Burladero and Salino the most. Both horses taught me how best to achieve particular movements by making sure that I was in the best position to make them happen. The cooking was outstanding. Chef Lena takes great pride in her cooking and with good reason. She checked to make sure if there were any particular dietary requirements. All of the meals were delicious and healthy (well, there were some fabulous desserts. The lodgings are not luxurious, but absolutely comfortable and appropriate for the type of stay. Had the most wonderful experience in my life the week I spent there. Was with Sherry Ackerman and 8 other fantastic riders. I learned more in one week than I have learned here in 2 years. I can't wait to come back and this time work with Paulo!! What an absolutely amazing experience! The people were so incredibly welcoming and knowledgeable, my trip exceeded ALL of my expectations. Thank you Paulo and Georges for sharing your knowledge and expertise - I learned so much in my short time there that I am already planning my next visit. Everyone who rides, no matter the discipline, need to visit and learn on some of the most beautiful horses in the world. Learn dressage from the masters in Portugal. Vacations can be catered to beginning or advanced riders. Check out suggested packages at this year-round riding destination.  Special discount of 20% for Programs during the months of January and February. Transfers are available from the Lisbon Airport with prior requests. The meeting point is near the Tourism Information desk, in the arrivals area. The riding center is about 30 minutes from the airport. A good basic riding level is required to participate in these dressage riding vacations. Riders shall be confident in all three gaits (walk, trot and canter) and understand the basics of dressage. Open all year and since there are covered arenas, even in July and August it never gets too hot. You can arrive and depart on any day. Open over Christmas and New Year, except no riding on the afternoon of 24 December, on 25 December and 1 January. Consider timing your dressage vacation with the Golega Horse Fair in early November. maximum of 10 riders at the same time.